c Original Color Correct light, Full Spectrum fluorescent light tubes with a natural light spectrum. New T8 LED Tube Lights run without ballasts! Lumens 4' T8, 1800- 2600! RDC, bi-pin, single pin. Color-correct, full-spectrum lighting now available in 3, LED order-pack sizes, see below. Serving the Dental profession since 1999. The best way to ensure your patient gets the smile they expect is to make sure that you and your dental team are seeing the same true color. 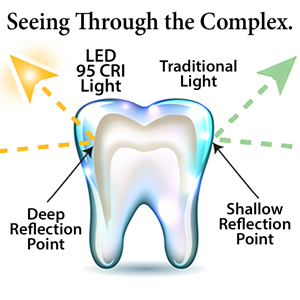 CRS Light has the color-correct LED and fluorescent light to help dentists, prosthodontists, ceramists/lab technicians, lab bench workers and denture finishers get on the the same visual playing field. "The Confidence in knowing that the team is looking at the same shade guide in the very same light as I am is quite reassuring." The big idea is keeping redos to a minimum, and chair-time to a maximum. Doing take-offs can be done in many lighting scenerios. Each different light will enhance a different spectrum. Dentists have found that having a light that is "neutral," not leaning cool or warm, in its spectra keeps the guess work to a minimum. This light identifies any possible hue leaning and gives you a chance to match it upfront keeping the surprises out of the picture. The photo indicates the visual gap between common light spectrums. The Kelvin and CRI light emision ratings are what differentiates our lights from the crowd. 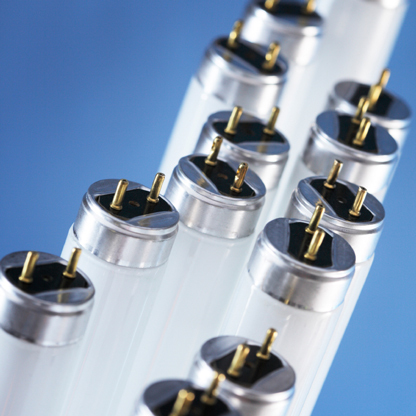 For fluorescent light tube choices in 4', T8 and T12 click here. - Can the new LED tube lights offer the same color correct light qualityas fluorescent? Click here for our comparison chart and LED light article. - About seeing through enamel acurately. 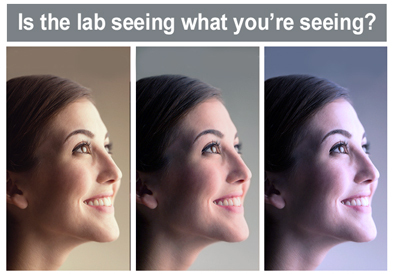 "As a Dental Lab owner who is very concerned about making sure every shade match is correct, we have installed all color corrected lights everywhere throughout our lab with CRS Light's advice. Our lab is bright and cheerful, we are confident that the shades going back to our doctors are spot on because we are using color-corrected lights. I highly recommend dentists and labs to be on the same page with their lighting. 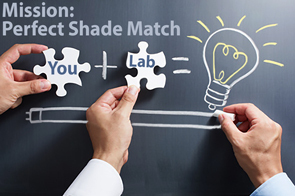 It plays such an important part of getting a perfect shade match and the lighting environment is much more pleasant to work under." -Save approximently75% on your light bill immediatly.